You’ve heard preachers talk about hell and what a horrible place it is, but is it REALLY real or just a gimmick used to scare you into a decision? 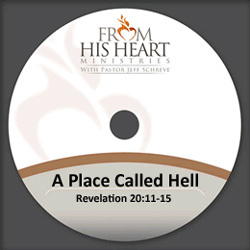 In this eye-opening message from Pastor Jeff Schreve called A PLACE CALLED HELL, he reveals what the Bible says about this VERY REAL place that is the final destination for all those who don’t believe in the Son of God and how to avoid it. This message is part of the 11-message series called WHY ON EARTH AM I HERE.